The 400w white Kudox heated electric towel rail provides independent bathroom heating and towel drying for family bathrooms and wash rooms. Styled with traditional straight bars and a crisp white finish, this bathroom heater will complement any interior. View the Kudox 400w White Towel Rail datasheet here. View the Kudox Towel Rail installation manual here. The White 400w Kudox Electric Towel Rail is perfect for medium-sized bathrooms and its attractive powder-coated finish makes it an ideal choice for anyone trying to create a crisp, clean bathroom interior design. This towel rail uses an energy-efficient thermal fluid element to make your bathroom and towels toasty in no time. The thermodynamic liquid inside the Kudox 400w has superb heat retention, so it can easily maintain its temperature without using a lot of energy. This model of the Kudox 400w comes with a white finish and a simple, straight-bar design that will complement any bathroom interior. 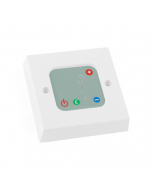 For extra safety, this product has a high IP55 ingress protection rating and is suitable for installation in zones 1 and 2 of your bathroom. Once attached to the wall-brackets, the fitted depth of this rail reaches 79mm. The Kudox 400w comes with a 1 Year Manufacturer’s Guarantee. A built-in thermo-fuse inside the heating element safeguards the towel rail against overheating. Electric towel rails for bathroom installation must be installed by a qualified electrician. Installing electric heating is a quick and easy process with none of the mess and expense of installing plumbing. All fixtures and fittings are supplied. For more information, see the Kudox manual.